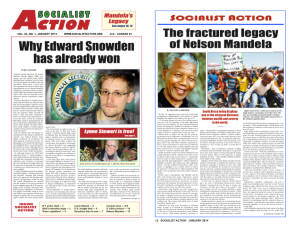 Socialist Action is a national group of activists committed to the emancipation of workers and the oppressed. We strive to revitalize the anti-war, labor, anti-racist, feminist, student and other social movements. In the process we hope to bring activists together from different backgrounds into a revolutionary workers’ party that can successfully challenge the wealthy elite. Our ultimate goal is a truly democratic society organized to satisfy human needs, rather than corporate greed. We’ve set up this page to introduce you to our organization, and to invite you to join us in the struggle to make the world a better place! Class Struggle & Independence: We believe that the world is divided into opposing social classes, and that the main driving force of modern history is the struggle between the working class and the capitalist class. We are active partisans of the working class and believe in the need for independent working class politics – not alliances with the capitalists, or any wing of that class. That is why we call for workers to break from the Democratic Party to build a Labor Party based on the trade unions. In all of our political work we seek to get workers to see and think of themselves in terms of class, and to recognize that their class interests are diametrically opposed to that of the capitalists. Revolution: We believe that the state and all of its institutions are instruments of the ruling class, and that therefore they cannot be used as tools of the working class, but have to be smashed. That is why we fight for revolution, instead of for seeking to merely reform or work within the system. When we fight for specific reforms we do so only with the understanding that in the final analysis real social change can only come about with the overthrow of capitalism, and the establishment of a workers’ government. We seek to link the demands for reforms with revolution through the Transitional Program and its method. The Specially Oppressed & Oppressed Nationalities: We support the struggles of those who are specially oppressed under capitalism – women, queers, national minorities, etc. We support and help build autonomous movements for the oppressed so that they can articulate their own demands, and develop political consciousness as a group. We support the right of self-determination for oppressed nationalities, including Blacks, Chicanos & Puerto Ricans. Internationalism: While we support the nationalism of oppressed nationalities as progressive, we are internationalists, and as such we hold that the workers of one country have more in common with the workers of another than they do with their own nation’s capitalist class. We oppose the nationalism of oppressor nationalities as wholly reactionary. We seek to link the struggles of workers and oppressed across national boundaries, and to build an international revolutionary movement that will facilitate the sharing of experiences and political lessons from one country with revolutionaries in another. That is why we maintain fraternal relations with the Fourth International. Vanguard Party: The capitalist class is highly organized, and to overthrow it the working class likewise needs organization. We believe in the need for a disciplined party of professional revolutionaries based on a political program that incorporates the lessons of past working class victories and defeats. The class struggle ebbs and flows – to maintain continuity and to be prepared for openings in the class struggle there is a need for an organization of always-active revolutionaries. We believe within such a party there must be complete and fair discussion and democracy, and the right to even form factions and tendencies to fight for your ideas. However, these democratically made decisions (the party line) must be binding on all members, and the party has to act as a common unit in carrying out the decided upon line in order to test if it is correct or not. This is called democratic-centralism. United Fronts: Recognizing the divisions that exist on the left and within the workers’ movement, as well as the low level of class consciousness that exists among many workers, we seek to form united fronts, and united front type organizations, around specific issues where various groups have agreement with us. In this way we seek to maximize our impact and the number of forces that can be mobilized around a given issue, demonstrate the power and effectiveness of mass action as opposed to symbolic small-scale and individual actions, and expose others on the left and the workers’ movement to our method of functioning and our political program. We also see this as the way of achieving meaningful revolutionary regroupment – because it allows different groups to work together and see whether or not they have significant political convergence. It should also be said that while we support the tactic of the united front, we are opposed to popular fronts – multi-class alliances that subordinate the interests of workers to that of a wing of the capitalist class. Permanent Revolution: This famous theory by Leon Trotsky holds that revolution in modern times, even in under-developed countries, has to be led by the working class and has to be a fully fledged socialist revolution – revolution cannot go through stages and cannot be made in alliance with any wing of the capitalist class. To be ultimately successful it also needs to be an international revolution. We believe that a successful socialist revolution will result in a workers’ government that is based on elected workers’ councils.